Very architectural cold hardy Hebe with a tidy upright habit and masses of pale, sky blue flowers in summer. Deep green, glossy round leaves are congested around vertical stems. Very pretty year round appearance. 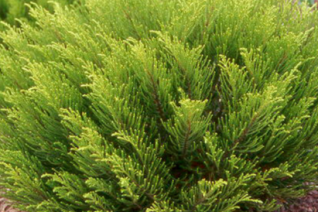 In time it develops a light tan/gray trunk which contrasts with the deep green foliage. To 3′ tall and usually half as wide for full sun an rich to average- to even poor soil that drains well. Light summer water- though this Hebe can take very dry summer conditions. Cold hardy below 10ºF. Very pretty shrub for tight spaces, rock gardens, borders. New Zealand. Ochre colored whipcord Hebe that is delightful year round for its deep hue as well as arching swept look of the shrub. To 3′ x 3′ tall and arching for a cool position in full sun- an open north exposure is ideal or part shade. Dislikes hot soil. Best in rock garden positions with great drainage- use boulders to shade the soil. White flowers appear at the branch tips in summer. A true alpine plant from high elevations in New Zealand. Perfectly hardy to cold. Light summer water- never boggy. Grows moderately fast. A very showy and dwarf form of this alpine species that is much easier to grow. Slow growing ochre colored whipcord Hebe to about 1′ x 1′ in half a dozen years. The fanstastic color literally glows in a landscape and is vibrant year round. Full sun in a cool position. Avoid blasting hot locations and locations with reflected heat – like near a rock wall. This is a true alpine and it likes to be comfortable. Light summer water once established in very well drained average soil. Avoid boggy soils + heat= certain death. In summer the top branchlets are decked out in pure white flowers. Adores. Rock gardens, open north exposure. Read: The north side of your house where it is bright and open to the sky and sunshine but protected from direct rays and scorching. Thrives at the cool Oregon Coast. Cold hardy to near 0ºF. Decumbens= decumbent which basically means crawling on the ground. Good looking decumbent Hebe with dark army green glossy round leaves outlined in red. They are attached to black stems- wonderful contrast and depth to this easy ground cover for full sun to part shade. Just 8″ high an individual plant can cover an areas 4′ x 4′ in several years. Rich, well drained soil with light consistent summer irrigation. Avoid boggy soils as well as dust dry and compacted. Loose and friable and this Hebe will surpass your expectations. 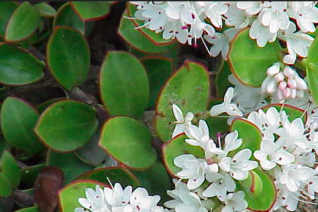 Clusters of white tinted blue flowers appear in summer. Not a total all out floral display but more random which is kind of nice. Cold hardy, disease resistant and long lived for a Hebe. Great dense evergreen ground cover. Fantastic Hebe that has stood the test of time. 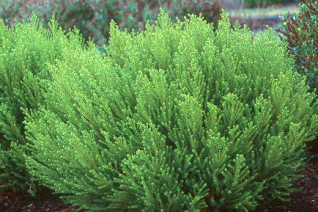 Large growing to 3′ x 3′ an upright shrub with fine silver/gray foliage held on black tinted stems. In summer spikes of white flowers appear. Cold hardy, low water, long lived Hebe that is a stunning focal point or even informal hedge. Moderately fast growing- about 6″- 10″ per year. Regular summer water speeds growth- low water when established. Full sun to light shade. A really pretty silver shrub that is elegant and easy to grow. We try to restrict our Hebe selection to those that are totally hardy to cold, thrive with a minimum amount of water, and are disease resistant. This pretty whipcord type checks all those boxes. Wonderful golden green upswept foliage on a rounded dense shrub. To 2′ x 2′ in time for full sun and well drained average to enriched soil. 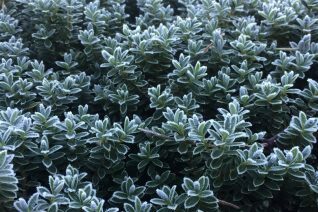 Alpine Hebe that is perfectly hardy to cold. In summer tiny white flowers appear at the branch tips. More of a temporary curiosity than a display. The great glory of this graceful shrub is its its year round excellent appearance. Light summer water. We love this tough and easy to grow whipcord Hebe. 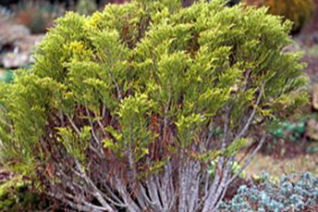 Ochre green upswept branches on a rounded evergreen shrub to 28″ tall and as wide. Full sun and rich to average well drained soil with light summer water. Takes very dry conditions when established. Perfectly hardy to cold down to 0ºF. In summer occasional white flowers decorate the top branches. Easy to grow always good looking little shrub. One of our favorite Hebes. 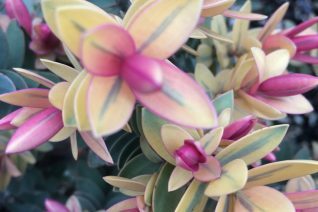 This dome shaped dense plant has new foliage that goes through some pretty showy transitions. Emerging tinted pink it takes on coral and light blue as well as pink before ultimately settling down to soft gray. The transition begins in early spring and lasts for months. In June small spikes of violet blue flowers add contrast. Cold hardy with average water needs for full sun and well drained RICH soil- this Hebe prefers more nutrients than others to really shine. Don’t be afraid to scratch in a handful of all organic fertilizer in early spring. To 2′ x 3′ in 5 years. Give it good air circulation with little crowding from other plants. Avoid watering when its blazing hot. Perfectly hardy to cold. Spectacular shrub. Offered only early in the season. Sells very quickly. Indispensible alpine cold hardy Hebe with an astonishingly uniform dense habit. Rounded to 30″ tall and up to 4′ wide in time. Blue gray foliage is handsome at all times. In summer sporadic white flower spikes dot the plant. Full sun to light shade in average to rich well drained soil Light, but consistent summer irrigation. Especially important for it to be well hydrated before extreme heat (above 100ºF). Excellent hedge, massed as a tall ground cover. Very cold hardy- not bothered by our coldest winters. Formerly known as Hebe sutherlandii. Xera favorite shrub. 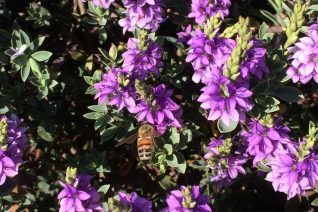 One the best Hebes that we have grown that offers cold hardiness, showy flowers, and a useful low spreading habit. 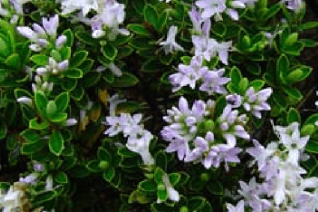 This ground cover Hebe with gray foliage and held on black stems spreads nearly prostrate to form a low dense shrub. In early summer the whole plant is smothered in deep violet purple flowers- among the showiest flowers of any cold hardy Hebe. Stems arch up and then immediately down cruising along at a moderate clip. 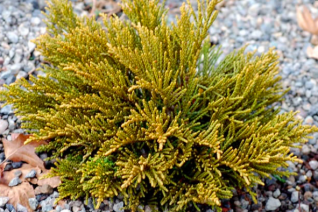 To 6″ tall and 3′ wide in full sun and well drained soil. Light summer water when established. Excellent plant for slopes (the stems root where they touch the ground) as well as rock gardens. Placed near a wall or container edge and it will gracefully spill over the edge following closely the contour of any object. Plant density inhibits weeds effectively and it can make a useful ground cover placed on 2′ centers. 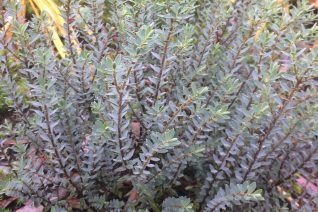 Very tough little evergreen shrub and always good looking.